The number 10 Big Clear housing is a large capacity housing suitable for high flow applications. The extra large housing allows for greater water filter cartridge capacity, reducing the number of vessels required for high flow-rate applications. The number 10 Big Clear Housing will meet all of your large-capacity filtration needs, including high-flow and heavy-sediment applications. Durable construction. Ideal for homes, farms, private wells, restaurants, swimming pools, spas, and trickle irrigation. The water filter cartridge is not included with the housing. This allows you to purchase the best water filter for your water supply. Big Clear Filter Housings offer on-site examination of flow, performance, and cartridge life and are ideal for a variety of applications. The polypropylene caps include a pressure-relief button on the inlet side to relieve pressure inside the housing when changing water filter cartridges. Whole House housings extend the life of washing machines, water heaters, and other household appliances. 1-inch inlet/outlet for high-flow and heavy-sediment capabilities with minimal pressure drop. Leaking is prevented by the dynamically sealing O-Ring. The O-Ring should be replaced periodically to prevent leaks. Number 10 Big Clear Whole House Housing Tips: For many applications, it makes sense to install two whole house housings. The first housing is for sediment reduction. The second housing is for the carbon filter to improve taste and odor and reduce additional contaminants. By installing the sediment filter first, the carbon filter will last longer because it does not get clogged with sediment. Since carbon filters are more expensive, it is better to have the sediment filter first that needs to be replaced more often. If you install two whole house housings, there is a double mounting bracket available for installation of two housings. If you have a lot of sediment in your water, you may want to consider three housings. The first two housings are for sediment reduction. The first housing contains a higher micron sediment filter and the second housing contains a lower micron sediment filter. The third housing is for the carbon taste and odor water filter. An example application is the first housing containing a DGD-7525 filter, the 2nd housing containing a DGD-5005 filter, and the 3rd housing containing a carbon filter such as the GAC-BB. If you install three whole house housings, there is a triple mounting bracket available for installation of three housings. 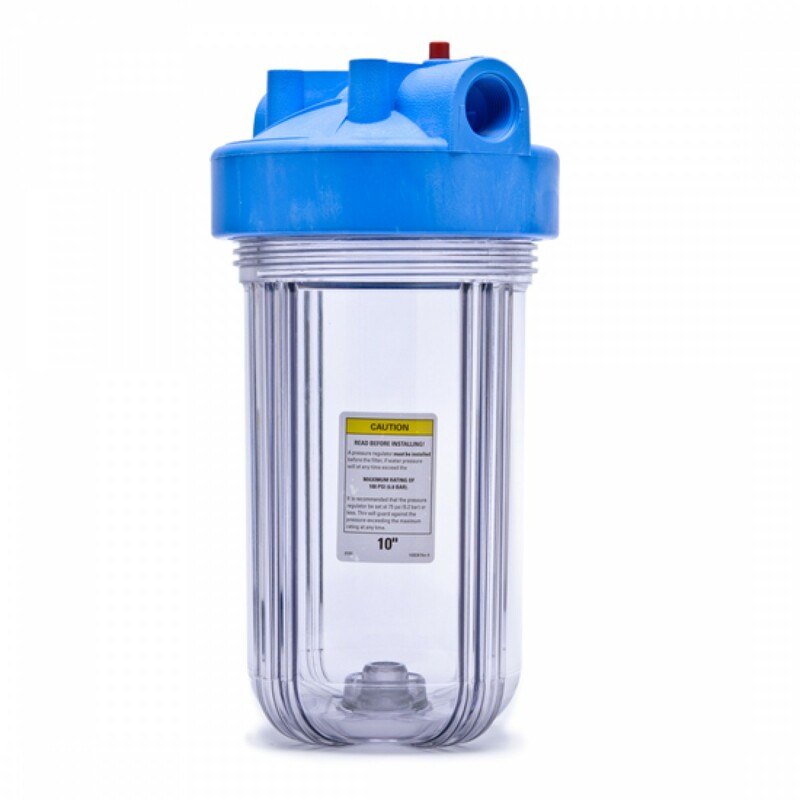 Sediment water filters reduce dirt, sand, silt, sediment, rust particles, and scale particles. 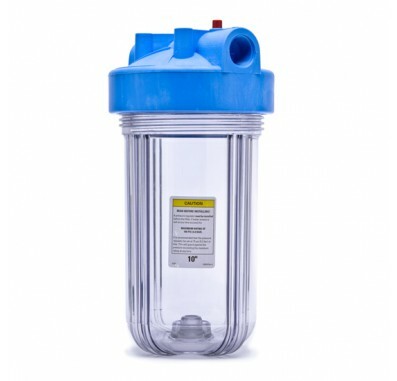 Choose from one of our sediment water filters at the 10" x 4.5" Big Blue Filter Page. Drinking water filters produce healthier, better-tasting drinking water by reducing chlorine taste and odor and other contaminants. Choose from one of our carbon drinking water filters at the 10" x 4.5" Big Blue Filter Page. Replacement WBC-OR Square Cut O-Rings. One o-ring is included with the housing purchase, but you should replace the o-ring periodically to prevent leaks. Use the BW/BC housing wrench to remove the sump. The wrench should NOT be used to tighten the sump back onto the cap. Tightening may cause damage to the o-ring. Use a single stainless steel mounting bracket to mount the whole house housing. There is also a double mounting bracket or triple mounting bracket if you purchase multiple housings. Another option is the the housing stand to set the whole house housing in.